Last season I had the chance to surprise a young fan (who shares my first name!) that dressed up as me for Halloween. CalBears.com wrote a feature on the story that you can read here. It doesn't mention it in the feature but I had met Patrick earlier in the season before one of our games. He was on the sideline with his dad and they came up to me in between drills during warmups to say hello. 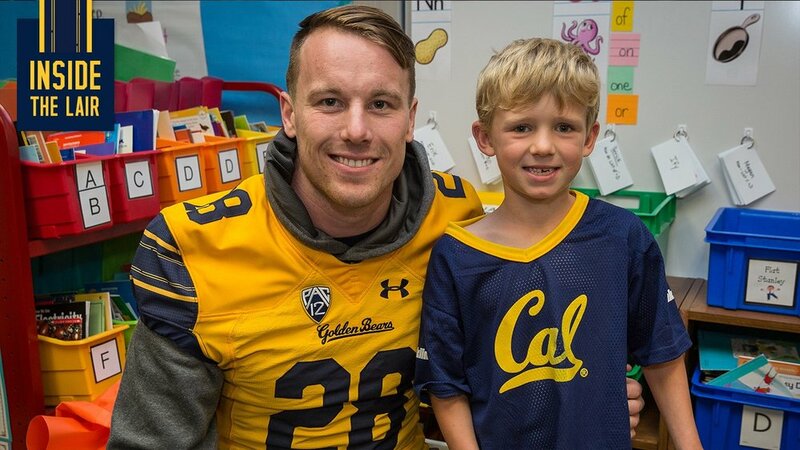 Patrick turned around and showed me he was wearing his Cal jersey with the #28 on the back! At that moment, I realized the opportunity I have to make a positive impact on anyone that looks up to me. I had no idea Patrick and I would cross paths again. I'm happy a teacher at the school was able to connect with me and let me know about Patrick's plan. It was a surreal experience for myself and something I'll never forget. I'll be posting news and updates regarding everything going on with Walk On Then Run. My goal is to build a community around WOTR's core values. I hope you will follow along. The first thing I want to accomplish is curbing the effects of Summer Learning Loss. The first of WOTR's core values is Academics. There can be a ton of value found in education. One of the foundations of learning is the ability to read, and read well. It's imperative that kids develop their reading skills early on and not fall behind. A prevalent issue that many students face is the lack of reading done during the summer vacation period. All it takes is a little encouragement and discipline to stop the negative effects of Summer Learning Loss. I want to help kids make a Summer Learning Gain. To do that, I'm hosting a Summer Reading Challenge. From June to August, I will be encouraging students to read just 4-6 books over the summer months to help stop Summer Learning Loss. All the students (grades 1st-6th) who complete the challenge will receive tickets to Cal's first game September 1st against the University of North Carolina. I'm excited to host this challenge and encourage everyone to find the value in being a life-long learner. I know great things are never accomplished alone. I want to encourage everyone, whether they're students, parents, people in the community, to join the challenge. We accomplish great things when everyone is involved. I'm encouraging everyone to reach out and connect with me and help in any way you know how! Visit the Reading Challenge page to learn more.